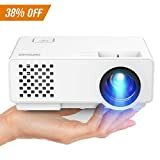 AuKing Mini Projector 2400 Lumens Portable Video-Projector 55000 Hours is currently selling at $69.99, approximately $0.68 higher than average, giving a potential saving of $190.00 right now. With a lowest price of $44.99 and an average of $69.31 it is selling on the low end of its usual range. Price volatility is 1.49% (meaning it does not change often), so the price should stay low for a while. Right now this product is a recommended 'good deal'. 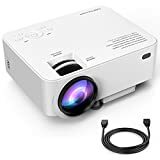 Compare the current price, savings (in dollars & percent) and Buy Ratings for the top Portable Projectors that are closely related to AuKing Mini Projector 2400 Lumens Portable Video-Projector 55000 Hours. 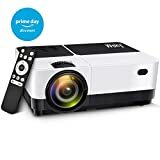 Here is how AuKing Mini Projector 2400 Lumens Portable Video-Projector 55000 Hours compares with other leading Portable Projectors. The compact size allows you to take it everywhere,living room,bedroom,even put it in backbag for a trip,enjoying an impressive party with your friends or a romantic encounter with her/him. 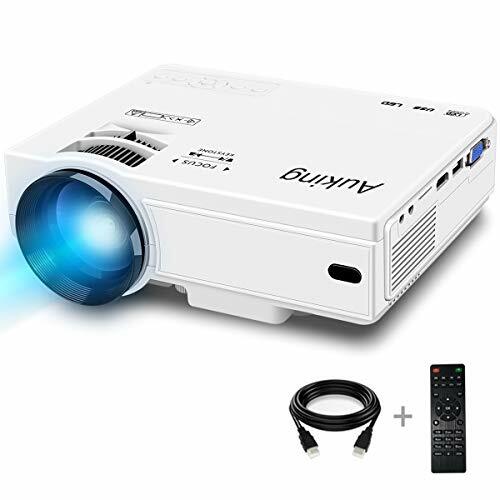 AuKing mini projector providing the unique 55000 hours super long lamp life,it mean that you can use for about 15 years with 10 hours use per day. 1.Not Recommended for PPT,Word,Excel or business presentation. 2.Recommend to use this projector in dark environment for better performance. 1 X AuKing Mini Projector 1 X AV Sign Cable 1 X Remote Control 1 X HDMI Cable 1 X Power cable FeaturesThe bright projector you need:AuKing leading Projector is the ideal projector for home entertainment,added an extra 30% lumen, brighter and clearer than other comparable projectors,provide you with A premium private cinema.Enjoy the great screen:The large projection screen of 32-176 inch can easily adjust the size according to the size you need. Watch a cool movie on the large screen, listen to a concert you love or play a game cheerfully, and feel the immersive pleasure.Revolutionary upgrade:New cooling design greatly reduce the fan noise,Providing the unique 55000 hours super long lamp life and unprecedented experience for you.Powerful compatible Projector:AuKing mini projector is compatible with TV Box, Amazon Fire TV Stick, ChromeBook, PCs, Laptops, Tablets, Blue-ray DVD player, SD Card, USB Flash Drive, Media players (Music, Pictures, Video, TXT), iPad, iPhone, Android Smartphones ( Wireless HDMI Dongle is not included).